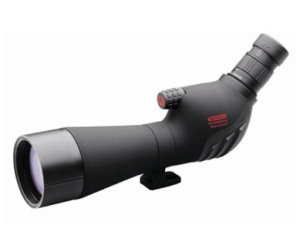 This attractively-priced spotting scope from Redfield features a huge 60mm objective lens and a powerful 20-60 times magnification capability. Built in solid black, this futuristic and powerful spotting scope will look good when used in conjunction with any hunting rifle or long gun. The Redfield Rampage ships with its own carrying case and strap, as well as a short tripod. The carrying case features a “view through” feature, allowing users to look through the objective and eyepiece even while the scope remains in the case, protected against rain, snow and other forms of inclement weather. It should be noted that the included tripod also comes with an adaptable mounting foot for use in variable conditions in the field. Probably one of the most important parts of any rifle scope or spotting scope is the eye relief. If it’s too short or not protected enough, shooters could inadvertently injure their face or eyes. The Redfield Rampage comes with a long 17-14mm eye relief with a twist-up style rubber eyecup to provide two different layers of protection against recoil. It should be noted that the Redfield Rampage is a spotting scope, meant to be used independently and not attached to a rifle or other long gun. While I loved all the features right out of the box, I knew I needed a bigger tripod so I bought one from a different manufacturer, and was quite pleased to see that it fit the standard attachment on the bottom of the Redfield Rampage. Once I “zeroed” in the scope, I found that it maintained accuracy wonderfully. The multicoated optics on the scope are superb, and far more than 90% of the light is getting passed through the body of the scope, giving me a crystal clear and detailed image. I practiced dialing in shots as close as 100 yards and as far out as 600 yards, all targeted using the Redfield Rampage, and I was enormously pleased with the results. Not only was I drilling several consecutive bulls-eyes but my accuracy didn’t tail off over time but remained constant using targeting adjustments that I made with the Redfield Rampage. Out in the fields and bogs of my property, I had no problem with the Redfield Rampage fogging up or any moisture leaking into the durable polycarbonate housing. The protective sleeve and carrying case did a great job of letting me look through the sight without exposing the rest of the scope to driving rain and one freezing ice storm that blew through camp on our last night out. Lens caps snap on super snug when not in use, making the Redfield Rampage perfect in any kinds of weather or atmospheric conditions. Although there are far cheaper rifle scopes available on the market, the Redfield Rampage simply offers unparalleled quality. With an incredibly powerful 20-60 times magnification, hunters and shooters can accurately place and land even the longest shots. Large game and other big targets can easily be acquired from a safe distance, allowing hunters to improve their marksmanship and shooting accuracy.